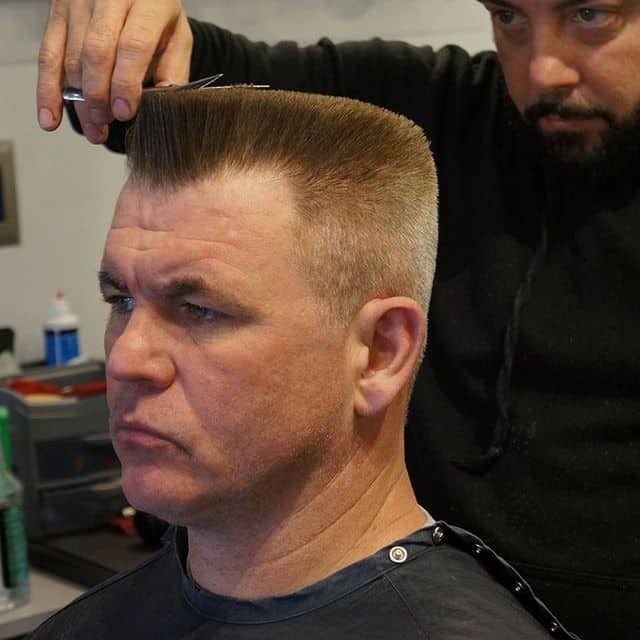 When the flat top haircut came around, it was such a hit that never has died down for over 3 decades now. Those guys who still flaunt this hairstyle look trendy and it reminds you of the greatness that will never lose its taste many years to come. If you still hold some great memories of this legendary style, here are 25 types that will give you a standing ovation where you go. The sides faded to the skin, the high end begins immediately after the fade and then it widens as it goes up. It is such a lofty look combed to a refined smoothness. Expertly trimmed to a medium size, this style is a catch with many men today. With clean faded sides, it is a stunning appearance. The sleekness starts from the front and drops to the back in nice straightness. It is styled with waves on the sides with a black bottom and brown top. It is long and contrasted with the bare sides. You’ll get the look of a star with this haircut. The hair is trimmed to a relatively short size and then curled into short stub-like appearance. With cleared sides and a short straight parting line it is what you would want for easy maintenance. The top section is separated from the sides by a grooving line. At the high end, the hair is left with its tips and then given an intended slight side sweep. It is a great finish that gives a new dimension to the flattened landing haircut. The sides are shaved and the top is trimmed to a compact portion. 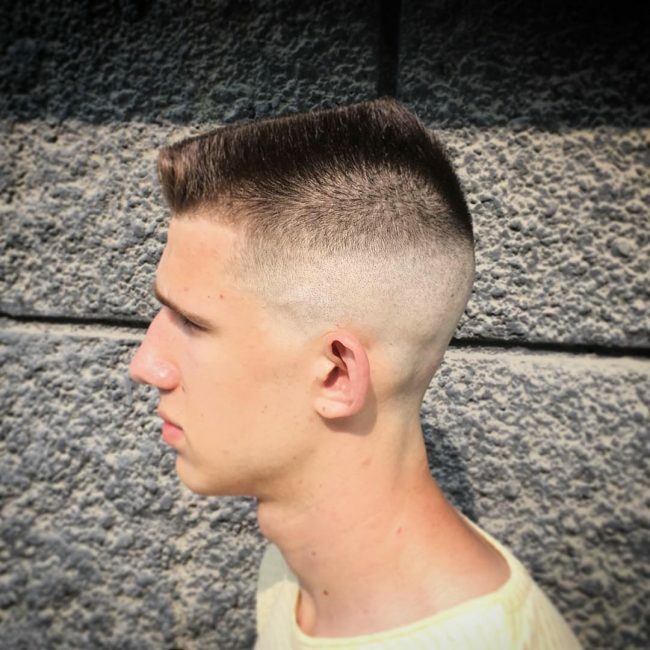 The genius in this cut is the 3-fork appearance from the front. One of the fork's ends is colored to a dramatic finish. Only the low sides are trimmed but the rest of hair is styled into a blunted appearance. The sides and top are left thick and shiny. There is an effort to make the top patch into a flat landing. Here is where the idea began. Hair trimmed to a thick compact, it is left looking stout and the top is pronounced to get positive admiration. A cliff-like appearance at the front is what begins this hairstyle. It slants towards the back and then ends naturally into the faded back and it dissolved into the wilderness of bareness on the sides. Here is how it used to be done back in the years. Thick mop and relatively short with clean sides and there you have what was then the best top. Who said that this haircut can never be touched with a modernist creativity? Here it is with a slid back top that is guarded on the sides by cleanly shaven sides. 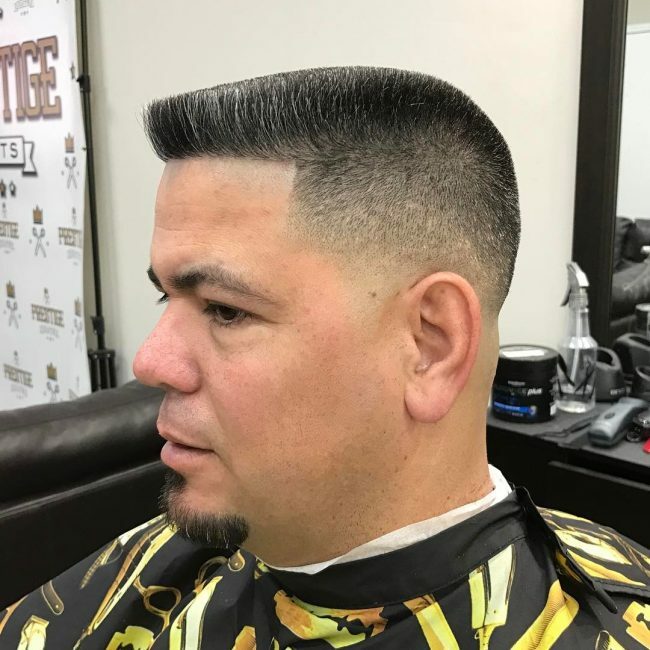 It can be short and still pass for the greatness of this style. Faded sides give rise to what is a vertical climb only to be ended abruptly just less than an inch from the scalp. Vertical rising strands form the canopy at the top and end with blunted tips creating a flatbed impression. It is a creation that has caught up with celebs and you will see them showing it off. It is short and exclusive for those who do not want the noticeable high end. Sides are layered into varying lengths before it ends up with a longer but tamed top. 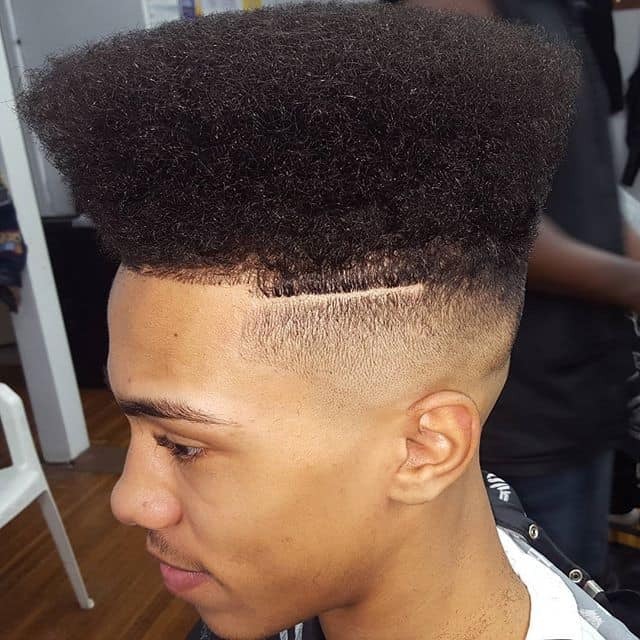 It is the realest high top but this one has an addition of radiant yellowish color. It is supremely pronounced on the tips and you would fall in love with what you see. What makes the flattened top earn its honor among the best styles is its ability to get close and acute with the edges. Here you can map out the patch by looking at the side edges that reinforce the thick high middle portion. If you thought that this is not a style for curly hair, here is a proof that you were wrong. The high middle patch is left to make wild curls and you can attest that it’s such a brilliant creation. Styled into a wider bottom than the top, it appears like the barber wanted to create a vicar’s look-a-like cap. It is contrasted with clean sides and it is mercurial in every sense. The sides are typically cleared leaving a high landing at the middle. It then goes ahead to divide the top into tides: the back part moves forwards while the front moves towards the back but with a slight sweep. It copies a military cut but this one has the high patch strands spiked. It is even impressive if it is mixed with a thick chin beard. Sides are faded to the skin. The top is acutely trimmed to show how the barber can get intense with the razor. But it only goes that far and the results are glaring. 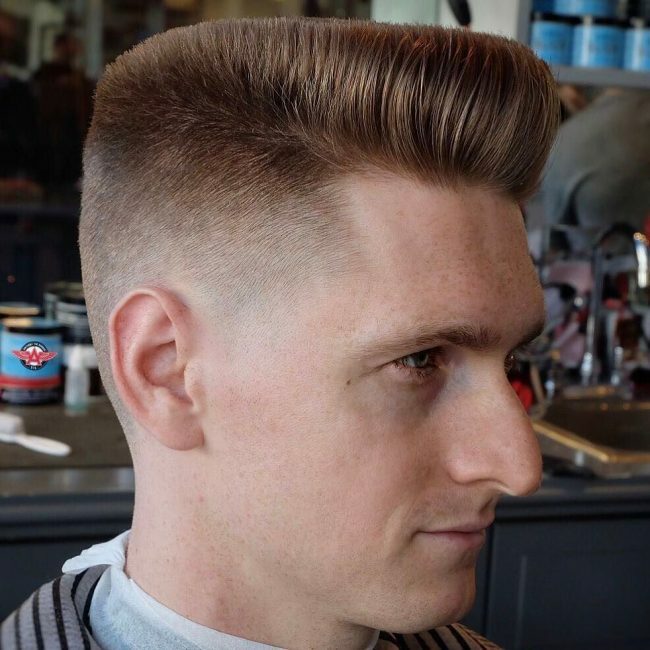 It can get as handsome as you want with side sweep flatness. A straight line clearly parts the sides and immediately the sweep begins at the front hairline. You can see a military guy here and it is all attractive to have it too. Short straight middle patch and cleared sides are such a mind blowing appearance. The top glow can still be a part of this. The hair is combed backward but not into fine strands leaving a rough tone in it. You can bring waves back to your style have an impressing cliff with your short blond. Trim it and comb it towards the back and here is your rebranded style. 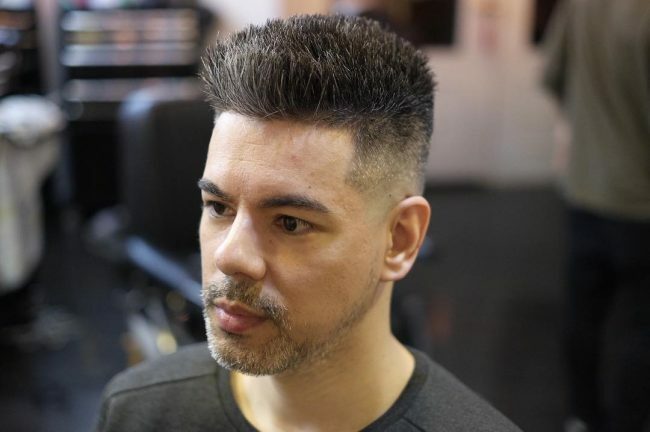 There you go, bring back style to your haircut by making a pick from this exclusively beautiful pieces of the flat top haircut. They are timeless and you will never worry about your hair whichever event you are attending.